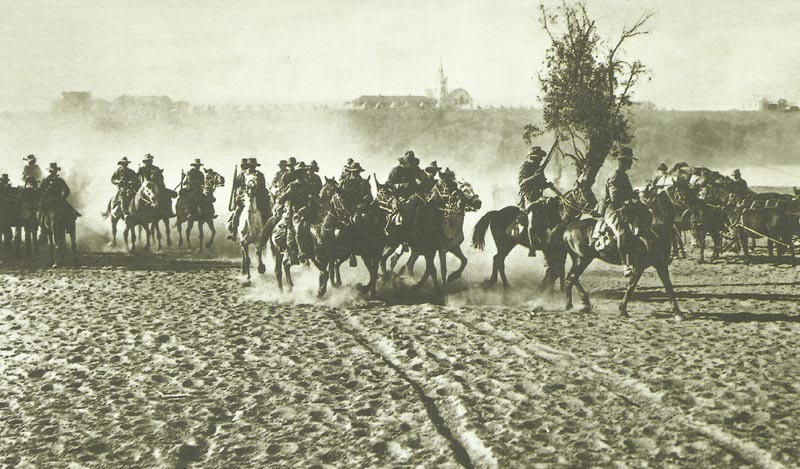 South African mounted troops prepare to invade German Southwest Africa. Southwest Africa: Deventer‘s South Force of 9,000 men invades at Schuit Drift, river Orange. Berrange’s East Force (2,500 mounted infantry with 2 guns) starts across Kalahari Desert (reaches Rietfontein on border on March 31). German Tenth Army withdraws from Augustow Forest to just east of border, Russians pursue until March 9. Greece: Prime Minister Venizelos resigns at King’s refusal to send troops to Dardanelles (Colonel Metaxas of General Staff so advises King) after Prime Minister offers 3 divisions. Gounaris becomes Prime Minister on March 9. King dissolves Parliament on March 11.